Discount Calculator is a great shopping app that makes your life easier by calculating discounted prices as quickly and easily as possible. 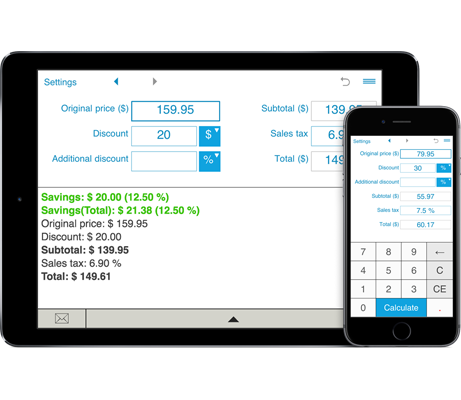 Discount Calculator calculates the final sale price based on the original price, discount, and sales tax. You can calculate multiple discounts. The calculator shows the final price and the amount and percentage of savings. You can make calculations in one of 32 supported currencies. Discount Calculator keeps history, so you can easily check and compare your recent calculations. Discount caclulator is a handy tool that helps you find out the price to pay for an item with the discount and sale tax. - enter the discount(s). You can enter a discount as a percentage or as discount amount and easily switch between these options. You can easily add the bonus discount. - enter the sales tax (if applicable). You can pre-define sales tax in the Settings window, so you don't need to enter it again. - click "Calculate" and get the final price and the amount of money you save. Discount Calculator calculates the discounted price and how much you save.